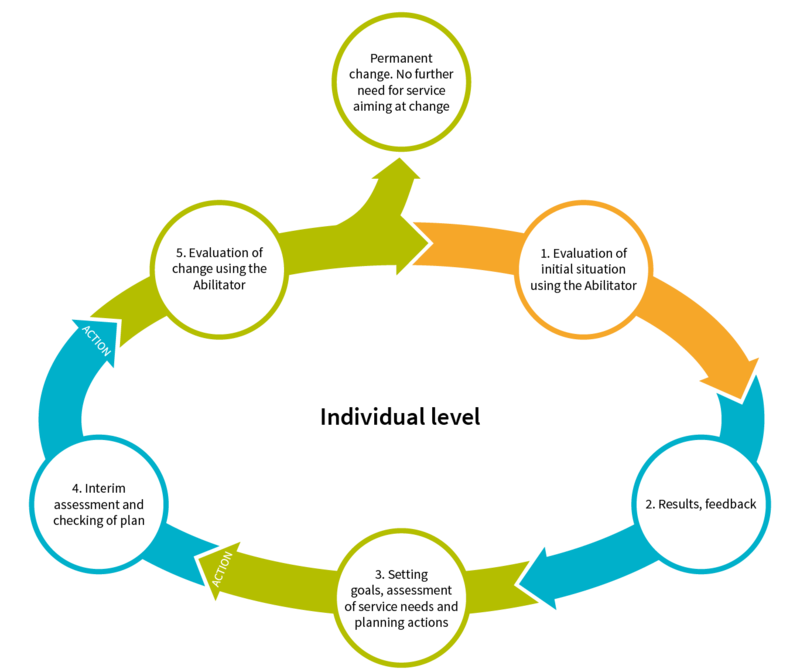 The figure presents an individual-level cycle of the Abilitator method in client work. The cycle is tailored to suit the goals of the individual. A client’s service path may follow several successive cycles if necessary. 1. Evaluation of initial situation. The process promotes customer orientation, as the evaluation is made by the clients themselves. Clients complete the Abilitator questionnaire in the form most suitable to them (online or on paper) and receive feedback when the responses are saved on the Abilitator web service. Professionals also receive their clients’ feedback and individual answers to support their work. The Abilitator feedback discussion may reveal areas on which there is a need for further information to expand the evaluation. Be careful not to set too many goals for one cycle. The goals will serve as a basis for deciding on services and actions. Think together with the client about what sort of service package would best promote their situation and support the attainment of their goals. 4. Interim assessment and checking of plan. If the process is long (6–12 months), we recommend an interim assessment. This assessment should be conducted at least half way through the process. On the basis of the results, you can check whether the changes are on the right course, whether the client should continue in the same way, or whether actions should take a different course. You may conduct several interim assessments. 5. Evaluation of change. At the end of the process, you can use the Abilitator questionnaire to evaluate changes. By comparing the initial and final measurement results of the cycle, you can evaluate any individual-level changes in work ability and functioning. The respondent also receives visual feedback.